The post-exilic prophet Zechariah includes Sukkot in his eschatological vision. For Zechariah, Sukkot will one day include not only Israel but also the nations, who will make an annual pilgrimage to Jerusalem to observe the feast. If they do not, they will experience drought (Sukkot is connected not only with harvest but also prayer for rain in the coming growing season). The Talmud also mentions the significance of Sukkot for the nations, by identifying the 70 bulls sacrificed as representing each of the 70 nations (b.Sukkot 55b). 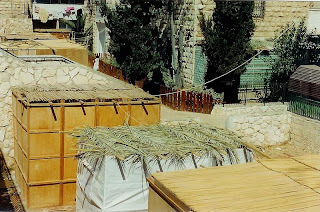 The Talmud also predicts that God will give the Gentiles an opportunity to prove that they are willing to obey the Torah by asking them to observe Sukkot. However, when God sends hot weather the Gentiles will give up and kick their booths. Jubilees goes on to give some details about the sacrifices Abraham offered. Throughout the description emphasizes the joyous nature of the festival, which may explain why Jubilees decided to connect the observance with a joyous occasion in Abraham and Sarah's lives. Throughout history the joyous nature of the holiday has been emphasized. Jubilees also tells us that it was Abraham who named it "the festival of the Lord" (16:27). We're also told that "He celebrated this festival for seven days, being happy with his whole heart and all his being -- he and all those who belonged to his household. There was no foreigner with him, nor anyone who was uncircumcised." (16:25) Exodus 12:43-45 specifies that no foreigner or uncircumcised person can participate in the Passover, and Jubilees seems to be applying this to Sukkot as well (Kugel, Walk Through Jubilees, 104). This is very interesting to me in light of the Zechariah passage which speaks of Sukkot as a festival that will one day be observed by all the nations. Could Jubilees be responding to or clarifying contemporary interpretations of the Zechariah passage? This is just a very small sampling of ancient texts about Sukkot! To find out more about the holiday in general you might check out "10 things you probably don't know about Sukkot" and this article on Sukkot from the Huffington Post.